Nichol made the courageous move. Kemp has played very well for the Pirates. It was a case where Ruffin McNeill and his staff, IMO, completely out-coached the Virginia Tech staff and opened a window into some of the decision-making processes that these coaches go through. Trailing by two touchdowns early, Ruff and OC Dave Nichol made the call to let JUCO transfer quarterback James Summers take the reins from starter Blake Kemp – who had done a good job at QB up to that point, in fact leading the Pirates back to even the slate at 14-14. Kemp was playing well (as he has all season), but Nichol and Ruff had the courage to do what many coaches wouldn’t based on the play of the starting QB…they switched to the back-up. Part of the switch was planned ahead of time to give Summers – who is still mastering the full playbook – a chance to get some on-field action, but more so, it was a call born of instincts. The rain was coming down and the need to run the ball was greater against a very good Hokies’ defense. The rest, of course,was history in the form of Summers’ 169 yard rushing exhibition that produced a pair of TD runs. Nichol (and Ruff) should be lauded for having that courage. Kemp should be held up as an example for being the type of leader and person to understand and support the move, and of course Summers should be given credit for what he did on the field, which by the way came along with a 5-of-8 passing performance for 110 yards in a TD in terrible weather. It is this coaching move that has, IMO, led the Pirates to NOT a quarterback controversy, but moreso to a quarterback discovery. And that is this: Blake Kemp is a good quarterback. This team can win with him under center. 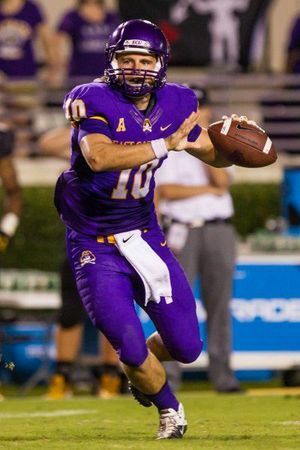 And James Summers is ECU’s starting quarterback – now. Like Kemp, he has earned it. The Pirates, who lost starter Kurt Benkert before the season, now finds itself in a most fortunate position. From the despair of not having a starter in the opening week, the Pirates should now rejoice in having two that have proven it against top talent. I am not a fan of playing two QBs going forward, unless game conditions or performance warrants it. Summers has earned the right to be the starter and Kemp has earned the right to be a starter in waiting. The offensive line is not good enough at run blocking to be a threat on the ground without Summers in the line-up…he opens up the running game for Chris Hairston and the crew. 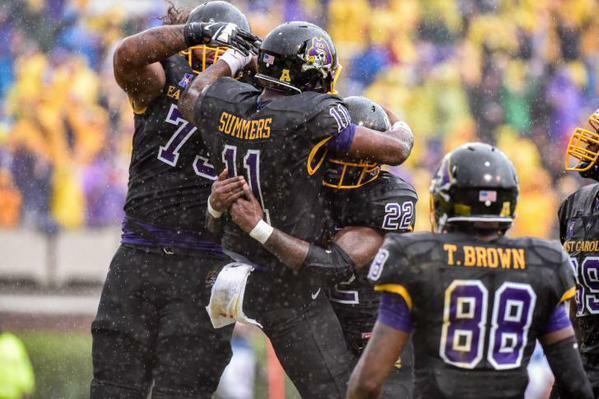 Against SMU, Summers rushed for 85 yards, meaning the running backs rolled for the other 220 yards on the ground. Lost in Summers rushing exploits over the past two weeks, which included 30 carries for 254 yards (8.5 ypc) and 4 TDs is the fact that Summers has hit on 14-of-18 passes for 263 yards and 3 TDs. That is a 78% completion rate with no INTs. His passing is not sub-par and his completion percentage is going to be high since he is such a threat to run the football. And, he plays the game with incredible passion…to see that guy come off the field, he is hyped and you can feel it through the TV screen…can’t imagine the impact he has on his teammates there in person. Gotta love that passion to compete…the type of passion it has always taken for a Pirate team to standout on the national scene. Back to the coaching courage thing. Kemp could well be a viable starter the rest of the season. The coaches could have said, “we brought James Summers here to play wide receiver” and it be the end of it. Coaches most of the time don’ t like to change plans because if it doesn’t work out, they are called idiots and if it does work out, people wonder why the hell they ever thought he was a wide receiver. It is a no win situation unless you win…if you know what i mean. Well, Summers is a winner and our coaches lit the fire by playing him despite the starter playing well, too. 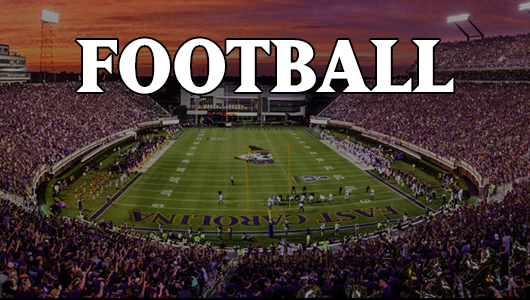 And so now, here ECU sits in a position where from an offensive perspective, the Pirates have a chance to beat anyone they play for the rest of the season because teams will have to pick their poison. If the defensive play against SMU was not an anomaly, then this Pirates team with Summers at the helm, is a dangerous team to play against every week. AND, should Summers have an off-game, or if the Pirates need a switch, you have a starter quality back-up in Kemp. If I had a vote, this would be the situation going forward. Summers the starter, Kemp the more-then able back-up. Unless there is some reason Summers cannot be the starter related to performance (like he can’t handle pressure of being the starter), then it is time to reset the depth chart and move forward behind one starter and not stir up any kind of controversy that would truly put more stress on either player. If Summers goes out to Provo next week and hits the three-peat in terms of performance, then Pirate fans should totally reset the expectations for this season and clear the calendar for late-December and early-January.